Oil Spill Environmental Forensics provides a complete view of the various forensic techniques used to identify the source of an oil spill into the environment. The forensic procedures described within represent various methods from scientists throughout the world. The authors explore which analytical and interpretative techniques are best suited for a particular oil spill project. This handy reference also explores the use of these techniques in actual environmental oil spills. Famous incidents discussed include the Exxon Valdez incident in 1989 and the Guanabara Bay, Brazil 2000. The authors chronicle both the successes and failures of the techniques used for each of these events. Dr. Zhendi Wang is a senior research scientist and Head of Oil Spill Research of Environment Canada, working in the oil and toxic chemical spill research field. He has authored over 270 academic publications and won a number of national and international scientific honors and awards. Dr. Wang is a member of American Chemical Society (ACS), the Canadian Society for Chemistry (CSC), and the International Society of Environmental Forensics (ISEF). Dr. Zhendi Wang is a senior research scientist and Head of Oil Spill Research of Environment Canada, working in the oil and toxic chemical spill research field. His specialties and research interests include: development of oil spill fingerprinting and tracing technology, environmental forensics of oil spill; oil properties, fate and behavior of oil and other hazardous organics in the environment; oil burn emission and products study; oil bioremediation; identification and characterization of oil hydrocarbons; and, spill treatment studies; applications of modern analytical techniques (such as GC, GC/MS, HPLC, LC/MS, SFE and SFC, and IC) to oil spill studies and other environmental science and technology. Dr. Wang has continually and extensively led and been involved in various scientific projects, technology transfer, and national and international cooperative researches with the total funding over 3 million dollars. He has authored over 270 academic publications including 72 peer-reviewed articles and 4 invited reviews in the most respected journals in the environmental science and chemistry, and 8 books and book chapters. The productivity, excellence and achievements of Dr. Wang have established him as a national and international “leading authority on the topic”. He has won a number of national and international scientific honours and awards. Wang is also a member of America Chemical Society (ACS), the Canadian Society for Chemistry (CSC), and the International Society of Environmental Forensics. Dr. Stout has more than 20 years of petroleum and coal industry experience. He specializes in chemical compositions of fuel-derived sources of contamination in terrestrial and marine environments, which includes crude oil, coal, gasoline and other substances. His research has been used for decision making by the United States Departments of Justice and Defense, and by the forest products, utility, railroad, wood treatment, maritime shipping, port operations, and oil and gas industries. 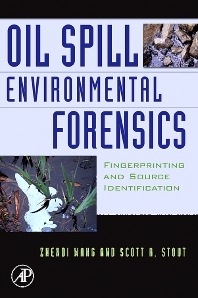 Dr. Stout has authored or co-authored nearly 120 scientific papers and edited a textbook on the environmental forensics aspects of maritime oil spills.